SANTA BARBARA, CA. 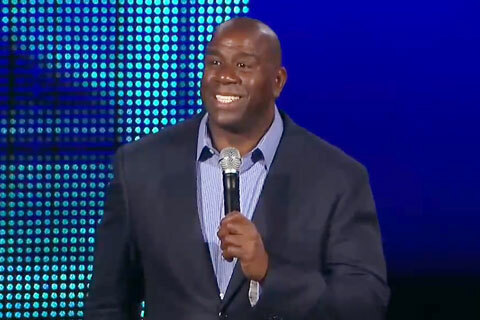 — Former Los Angeles Lakers point guard and successful entrepreneur, Magic Johnson, was the featured speaker on Friday, October 24, at the Arlington Theatre in Santa Barbara for his event, The Magic of Winning, where Magic discussed his life and career that led to his path to success. Source: Daily Nexus. Photo shows Magic Johnson speaking about his career at the 2014 YPO Global EDGE event. The talk, presented by UCSB Arts & Lectures in association with UCSB Athletics, had the basketball legend speaking about his life, from playing basketball in a high school divided by racial tension to his business ventures in minority communities. Throughout the night, Magic reflected on how his ideals and philosophy led to his achievements. Playing alongside Hall of Fame talent such as Kareem Abdul-Jabbar, James Worthy and against the likes of Larry Bird and Michael Jordan for nearly his entire playing career, Magic referred to his work ethic as the reason for his success on the court. Earvin “Magic” Johnson is an NBA legend, a two-time Hall of Famer, an entrepreneur, a baseball owner, a philanthropist and a motivational speaker. If you would like to book Magic Johnson for a speaking engagement or appearance, contact Magic Johnson’s booking agent for appearance & speaker fees at Playing Field Promotions or call 1.800.966.1380.